Northampton Saints star Courtney Lawes has been dropped from the England squad to face Ireland at Twickenham. Lawes misses out in favour of Saracens' Maro Itoje. It means that Lawes, can play in Northampton's Aviva Premiership clash with Worcester on Saturday. England Squad: Forwards D Cole (Leicester Tigers), J Clifford (Harlequins), J George (Saracens), D Hartley (Northampton Saints, capt), J Haskell (Wasps), P Hill (Northampton Saints), M Itoje (Saracens), G Kruis (Saracens), J Launchbury (Wasps), J Marler (Harlequins), C Robshaw (Harlequins), B Vunipola (Saracens), M Vunipola (Saracens). Backs: M Brown (Harlequins), D Care (Harlequins), E Daly (Wasps), O Farrell (Saracens), G Ford (Bath Rugby), A Goode (Saracens), J Joseph (Bath Rugby), J Nowell (Exeter Chiefs), A Watson (Bath Rugby), B Youngs (Leicester Tigers). England and Wasps star Joe Launchbury says he sees a tough week ahead, after England crashed out of their own Rugby World Cup. England lost at Twickenham to Australia, meaning they exit the tournament, with Wales and Australia progressing to the quarter finals. Speaking to ITV Sport, Launchbury added that the performance in next week's dead rubber against Uruguay will now be important to ensure England can exit the tournament with some pride. Warwickshire County Cricket Club’s Luke Sugg has been named as one of the England & Wales Cricket Board's Cricketers of the Year. Luke, who is an all-rounder for the Warwickshire Visually Impaired (VI) team, is the England Disability Cricketer of the Year for 2014/15 season after scoring 634 runs, including four centuries, at the 2014 Blind Cricket World Cup in South Africa. He finished the tournament with an average of 126.8 as England were knocked out in the semi finals. Get in you beauty! Brilliant from Sturridge, superb from Johnson, priceless goal for Rooney! England goalkeeper Joe Hart says the team are 'ready to go' ahead of tonight's fixture. 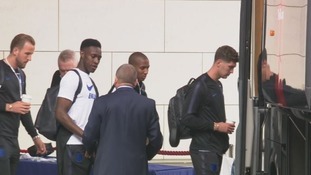 The 27-year-old, who was born in Shrewsbury, is expected to start England's second key game of the World Cup at 8:00pm. Police in Newark in Nottinghamshire say they have extra foot patrols out tonight for the England match. The England rugby team will be training at Loughborough University today ahead of the Rugby League World Cup. England take on Australia this Saturday at the Millennium Stadium in Cardiff. England are just one win away from guaranteeing themselves a place at next year's World Cup. An impressive win came on Friday against Montenegro and they have another home match tonight, this time against Poland. What could possibly go wrong? The only thing is that history is not necessarily on their side: in 1973 England failed to qualify after being held to a draw by Poland. Leicester and Stoke legend Peter Shilton was one of the players in the side and told us of the devastation he felt at the time.